Bosch hot water heater leaking? Bosch hot water system repairs? Wanting to upgrade to a high efficiency Bosch Continuous flow? Bosch is a world leading engineering company’s hot water technology. The Bosch logo represents 127 years of experience and over 50 years in the Australian market place. With their generous warranty and German engineering, Bosch is a manufacturer that you can rely on. Bosch has one of the largest range of continuous flow hot water heaters in the market place. This includes products from hydro generating technology to high efficiency condensing continuous flows. 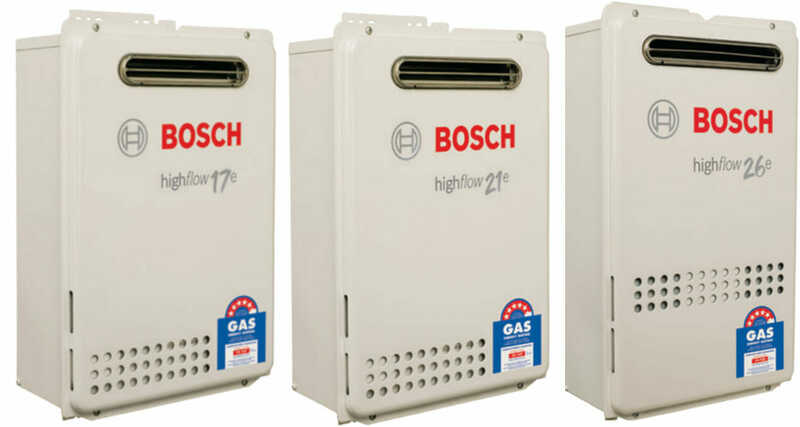 The Bosch high flow range come in compact 5.5 star gas efficiency models 17e, 21e, and 26e. These models have a continuous flow rate of delivering 17 litres/minute*, 21 litres/minute*, and 26 litres/minute* respectively. Additionally, these hot water systems are available in natural gas (NG) or liquefied petroleum gas (LPG) to suit your needs. Bosch continuous flow systems only heats the water you need. Therefore, this range of hot water system works in a way that ensures you will never run out of hot water. That means that the entire household can shower consecutively without anybody experiencing a cold shower. If you currently have an old Bosch WR250 or a Bosch GWH10 that needs repair or service look no further. Here at Same Day Hot Water we are the experts at fixing these units. We keep in stock and have readily available the different parts for these units including the hydro generating valves, ignition packs, and water valves. Bosch’s range of instantaneous hot water heaters are second to none. From their internal WR250 and GWH10 to their external Bosch TF 250, formerly known as the Water Wizard, they have set the benchmark in this technology. This range of Bosch products offers the innovative HydroPower systems. The mechanism behind this hot water system works by using the energy created by the water flow to conduct the heating process. A small turbine ignites a burner to start this process. Consequently, this system is not dependent on an electricity supply. Another feature of this process is that it only starts when a hot water tap is open and stops once the hot water tap is closed. Not only do you get hot water when you want it, but you also save money on your energy bill. The external HydroPower models include a comprehensive warranty. The Bosch Internal Compact hot water systems were built for homes that require an indoor unit with a small area of space available. The Bosch Internal Compact models include a comprehensive warranty. Bosch solar comes in both hiline and loline options. These systems can help reduce your hot water energy consumption by up to 65% through utilising the natural resources of the sun’s energy. The Bosch Solar Wizard is a loline system. It has both solar collector panels on the roof and a storage cylinder on the ground. This open loop solar hot water heater uses energy absorbed by the sun in the solar collectors. This water is then pumped down to a tank at ground level for storage ready for use by the household. The capacities the vitreous enamel storage cylinder comes in are 250 litre, 300 litre, or 400 litre. There is the option of a gas or electric booster for this hot water system. The Bosch Rooftop Solar is a thermosiphon solar system with the option of glycol or water based heat transfer. This means these systems are suitable for all climates over Australia. Additionally, both the solar panel collectors and storage cylinder are mounted on the roof which eliminates the need for solar pumps and controllers. This is a European designed high performance tank that is very efficient due to its utilisation of the sun’s energy to produce hot water. Interested in one of the Bosch Solar hot water systems? Download Bosch Solar Hot Water Systems Brochure. Since the heat pump technology harnesses the sun’s energy rather than using fossil fuels, it saves you money. More specifically, the mechanism behind a heat pump system works like the reverse of a refrigerator. Bosch offers a state of the art heat pump that combines this technology with an innovative design and high performance unit. The Bosch Compress 3000 heat pump is an air to water heat pump developed in Europe. The heat pump technology works by extracting heat from the atmosphere and transferring it into the water heater cylinder. Due to its European design, the Bosch Compress 3000 heat pump is able to operate at temperatures up to a very cold temperature of -7 degrees Celsius. This feature ensures that you have hot water no matter what the weather conditions are outside. Interested in the Bosch Compress 3000 Heat Pump?